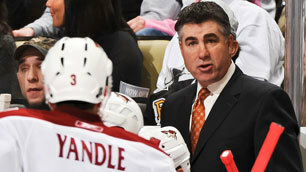 GLENDALE – As expectced, Coyotes Head Coach Dave Tippett, who has posted 156 victories in four seasons with Phoenix, has agreed to a long-term contract extension. Tippett will formally address the media about his new contract next week, but on Friday I spoke with him over the phone for a few moments to get his reaction. Tippett said getting to work with General Manager Don Maloney, Assistant General Manager Brad Treliving and the coaching staff is a major reason why he decided to come back. Like Coyotes fans, Tippett continues to monitor the ongoing ownership situation and is hopeful the team will remain in Arizona long-term. With 156 wins, Tippett trails only Bob Francis on the franchise's all-time victories list for head coaches. Francis has 165.